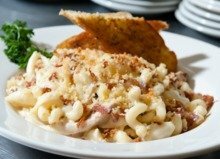 100% Durum cavatappi and shell pasta tossed with chicken and spiced chopped bacon in our housemade gourmet cheese sauce with a touch of spice. 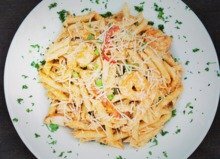 Penne pasta, red and green peppers, scallions, sliced chicken breast and shrimp tossed in a Parmesan cream sauce with a smoky, earthy spice "bite". 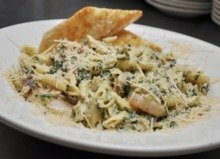 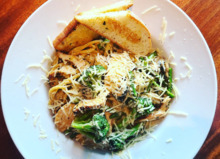 Penne pasta, Reggiano Parmesan cheese, spiced chicken and shrimp tossed in a spinach and artichoke cream based sauce.